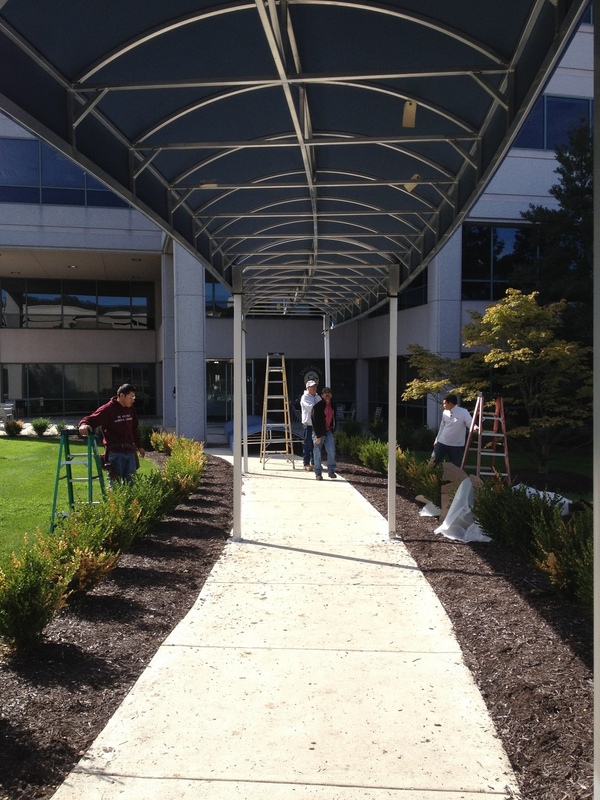 Meridian Properties was in need of a sidewalk awning for a property down in Tyson's Corner, Virginia. This sidewalk connected a building with its parking garage, and they wanted to ensure that people walking back and forth were protected from rain. The sidewalk itself was not straight; it was a sort of free-form curve, with nothing standard about its shape or design. We came up with the idea of using google earth imagery to get a good overhead shot of the sidewalk, which was good for determing the shape of the design. However, we still needed accurate measurements, because the awning was going to be supported with posts that would ideally be bolted to the sidewalk itself. This meant that our measurements had to be precise; otherwise, the posts would end up in the dirt, sacrificing stability. Using the overhead image as a starting point, we measured the distance between the building to establish scale in the drawing. Luckily, both the parking garage and the building itself were perfectly parallel, so we were able to use that to get a "base" line, connecting the two planes. We then measured from that base line to various points on the curve of the sidewalk. It was a little convoluted, but it ended up working out great. On the day of the install, our installers laid out all the sections of the awning directly on the sidewalk, to make sure everything was lining up correctly. This was a time-consuming step to be sure, but it's always better to be safe than sorry, especially on a job of this magnitude. Once that was done, it was time to begin the installation proper. We attached the first section of the awning directly to the garage, then began hoisting up the various sections with the posts attached. Bit by bit, the whole operation started to come together. All told, the installation took most of the day; Meridian and the building owners were very pleased, and now we are going to install some in-awning lighting systems to keep the sidewalk well-lit. Three exterior LED fixtures with a wide spread will be just right, and are scheduled to be installed in the next month.